The Prince Albert Speed Skating Club saw a record number of new skaters join the group. Most of the new skaters are under the age of ten. With the encouragement and support of their families, these young skaters are committed to attending practices. They are serious about training and measuring their improvements at speed skating meets throughout the season. ​This year, Coach Ron Hlasny retired from the club. Lambert Schwartzenberger, took over the role of head coach in September 2017 and says he’s up for the challenge. “I’ve taken coaching clinics and am always researching and networking with other coaches to learn more about the sport. I like to offer suggestions and tips to each skater to help them improve their performance on the ice,” says Schwartzenberger. Practices are held two times a week. Speed skaters get about an hour of ice time at the Art Hauser Centre in Prince Albert. The facility provides access to two dressing rooms for participants and houses safety mats used to line the boards at practice and in competitions. During practice, skaters complete a warm up on the ice and participate in drills and informal races to simulate competition. Schwartzenberger is assisted by experienced speed skaters, Jayden Bissky and Makenna Bloom. The group helps run practice for speed skaters ranging in ages from 5 to 14 years-old. The Prince Albert Speed Skating Club 2017-18 also offers a Learn to Skate Program for beginners. Eleven participants are registered in the Learn to Skate for the 2017 – 2018 season. Coaches for the group are Laura Schinbein and Ysanne Harris. They are assisted on the ice by 3 helpers Bode Bissky, Adam Ismail, and Ellianna Penney. The first competition of the season took place in Warman, SK on October 28 - 29, 2017. Eleven skaters took part in short track events. Some of the races in Short track are the 3000m, 1500m, 1000m, 400m, 300m, and 200m. Skaters from the club brought home three medals and several personal bests records. Several Prince Albert speed skaters are registered to compete in the Fire on Ice meet in Lloydminster, AB in early December. It is a one-day short track meet. There are more meets scheduled in 2018 across western Canada that members from the club plan to participate in. This includes the Saskatchewan Winter Games in North Battleford, SK during the February school break. The moto of the club is, fast is fun. The attitude is carried throughout the group in the parents, coaches and skaters attitudes. “Our first goal is to make sure participants are enjoying their time on the ice. They compete against themselves to obtain their best time in a race. Speed skating is about setting personal bests, not so much about rivalry like other sports,” says Nadine Penny, Prince Albert Speed Skating Club President. 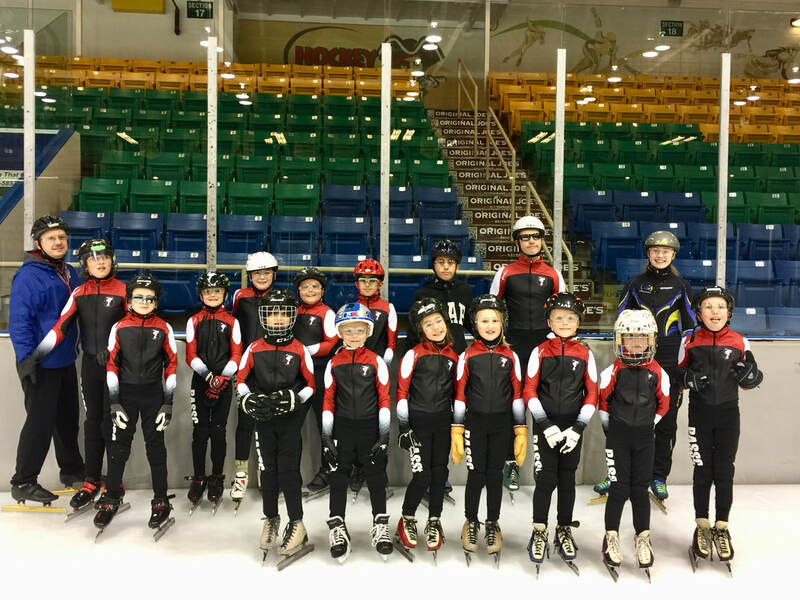 This fall, the Prince Albert club purchased new speed skating suits with the clubs logo and some new skates and blades. Club members can rent the equipment for the duration of the season. The public can find out more information about the club on their website and Facebook Page PA Speed Skating.